— Remove the leaves from the beets, keeping 1-inch stem. Wrap the beets separately in foil paper and place on a baking sheet. Bake for approximately 50 minutes or until tender. — Cool and remove from the foil paper; peel and cut the beets in 1/4 inch slice. FINALE — Place the beets on a nice serving platter. Drizzle with vinegar and olive oil, and sprinkle with fleur de sel and pepper. Add mint and onion. TRICK — Serve with grilled blue cheese croutons or any grilled meat. For lunch, add some goat cheese and grilled pine nuts. Replace the red wine vinegar with white balsamic or mix a bit of both. Variation: replace the onion and mint with lots of garlic and fresh basil leaves. Replace the red wine vinegar with any balsamic. 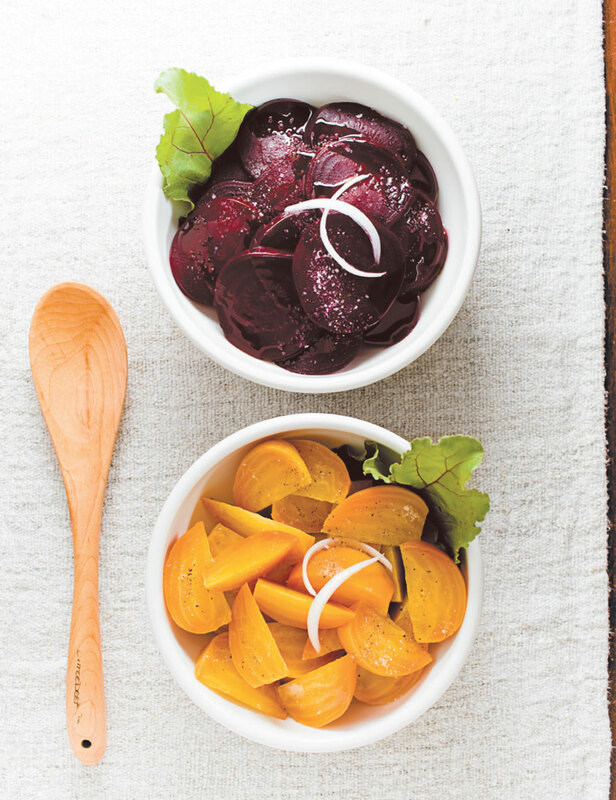 NOTE — Do not overcook the beets; you want to keep that little crunch. If the leaves are really fresh, use them as a chiffonade to serve the beets. Hope for leftovers since this salad is even tastier the day after.